Winter Weddings conquer up beautiful snow lined church pathways with berries and mistletoe. Very romantic, venues often are at their best during the Christmas and New Year season. We had one bride who married at Christmas in a church filled with candles and incense, she married in a gorgeous berry coloured dress and the whole event was amazing. Holly was recently interviewed for the national magazine ‘Take a Break’ about her experience and look how happy she was! Whilst this aubergine/berry coloured dress is absolutely ideal for winter weddings it’s not every bride’s, or their Mum’s, dream colour and the overall majority of brides do go for an Ivory coloured dress which can look just as beautiful. A dress with sleeves or straps is much better for the winter months, or a bolero jacket can be worn. A very special look is with an ivory fur stole or bolero, these can be striking against a background of Christmas trees or berries. A long white winter coat can also have a big impact and keep you warm! There is the opportunity to go bold with your makeup and use a bright red lipstick which looks amazing in the winter light but not at a Summer wedding. The colour of bridesmaid’s dresses is very important. During the winter season, it is good to consider metallic bridesmaid’s dresses as these are very pretty and trendy. A metallic silver or bronze compliments the winter wedding beautifully, the metallic dresses can also be worn again as the party season approaches. Wedding dresses that have sparkles and sequin designs are especially pretty in the winter sunshine. Veils also can be edged in diamante which will glitter as the sun goes down. For weddings in the winter, it is always fun to consider a wedding dress with colour which won’t be overpowered by the season’s colours. Have a think about Cappuccino or Aubergine, Sonsie by Veromia designers often have these colours in their ranges. Blush pink is very pretty and champagne is very trendy for this season. 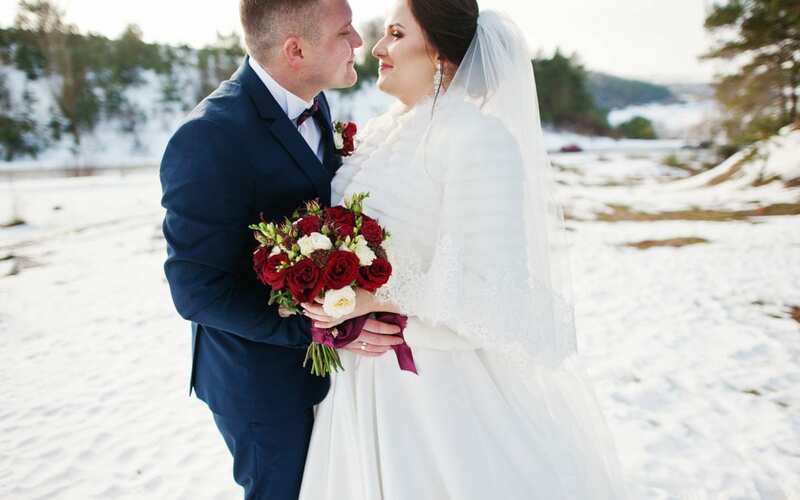 Of course, winter weddings are great for curvy brides who feel the heat and would be very uncomfortable getting married in the heat of summer. But one way of not getting too cold is to wear tights, these could be natural flesh coloured or lace white tights but they will help with chafing thighs, keeping toes warm and stopping rubbing of heels in new shoes. Talking about shoes, certainly, it’s not the time for flip flops! More for the filled in shoe, you do need to think about your shoes especially regarding the weather. Almost every bride you ask today will want to have flat shoes, for example, Converse flats are very trendy at the moment but it’s worth considering if it is or has been raining and your shoes get wet and stained then this, not the best look. Why not treat yourself and your wedding party to comfy warm slippers to be worn when you are getting ready. The weather is so important to weddings all year round, even if it’s sunny and hot, blowing a gale, raining or snowing. When you are buying your wedding dress, accessories and bridesmaids dresses from up to a year before your special day it is not easy to predict what the weather will be like. One item will help out whether it is summer or winter and that is the umbrella. In the shop we have umbrellas with a difference, they are ivory in colour and are heart-shaped, and they are large ‘golf’ type umbrellas that will keep you cool by filtering the sun or dry when it is raining. Of course, they are great props for photos. Choosing your venue is important for winter weddings not least for being easily accessible if the weather is snowy or so cold the roads ice up. This needs to be balanced against the amazing scenery and views when the weather takes a colder turn. There is nothing to beat a snowy winter scene for outside photographs. The prettiness of dark red flowers and berries in bouquets against a white background is beautiful, the theme of dark red flowers such as Roses or Peonies can be carried through to dressing the venue. Why not take advantage of the seasons decorations such as the Christmas Tree, baubles and the venue’s dressings? You could have the photos taken at the Christmas Tree and use this as your first Christmas card as a couple. You could create a snowy crystal theme with large glass vases with hanging crystals and white flowers followed through with small crystals scattered on the table. The snowflake can be used through the save the day cards, the invites, name settings and thank you notes, very bright, clean and seasonal. Taking the theme through to using gingerbread, eggnog and white candles. Favours could be packaged up like little presents or have a bauble with the guest’s name on for a place setting. Another idea is instead of signing a guest book you could have guests decorate a bauble with their names or a personal message and you can then use these on your Christmas Tree at home creating memories of your special day every year. Your Wedding cake can carry on the theme with little snowballs on and around the cake, also snowflakes, there could be glitter or red flowers matching the bouquet. Thinking about transport to and from your winter weddings venue is an exciting opportunity to do something different such as a romantic sleigh drawn by horses wearing sleigh bells. 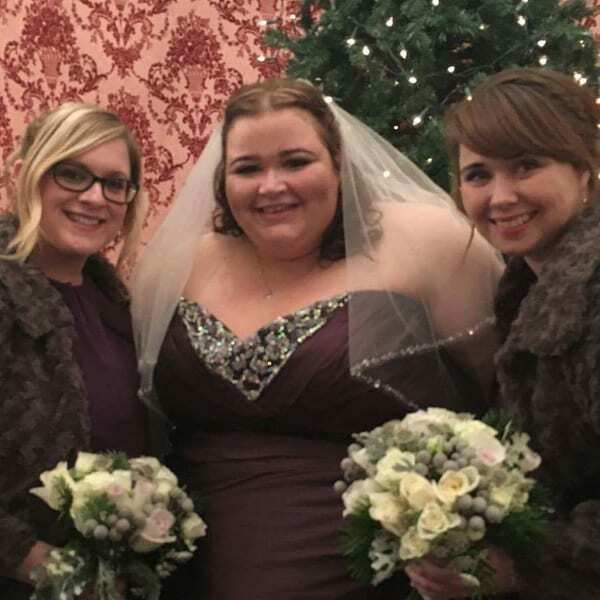 Even if you are getting married at your venue it’s a real opportunity to have a special sleigh ride just the two of you after the ceremony, spending some precious time together on a busy day. Oh don’t forget to have lots of mistletoe around – you may get lots of kissing and some invites in the future for more winter weddings.